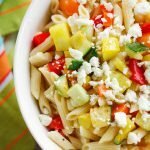 Enjoy a rainbow of vegetables in this easy-to-make summer pasta salad that is tasty and delicious and serves up perfectly at any barbecue. Even your kids will eat their veggies with no complaining. Wouldn’t it just be easier to buy a pasta salad box mix at the grocery store? It sure would, but it wouldn’t taste as good. Put down the boring box mix! My ingredient list is long but don’t be discouraged. This pasta salad uses whatever vegetables you have available in your fridge. Chop them up, roast them if need, and drizzle with a homemade dressing. It’s that easy! Fresh cut veggies add crunch to any pasta salad but have you tried roasting some of the vegetables first. I used both raw and roasted veggies in this recipe and the results were outstanding. 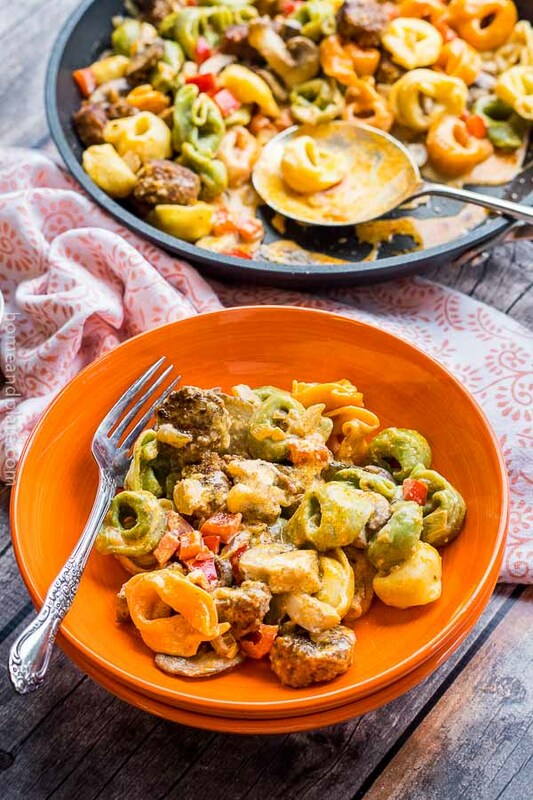 Pair this pasta salad with my Chargrilled Lemon Garlic Chicken, Salt Seared Lamb Chops or Spicy Grilled Shrimp Skewers. It’s great with just about anything off the grill. I had leftover ears of corn, a zucchini and squash and plenty of sweet peppers. My neighbor was leaving for vacation and brought over some cucumber and fresh feta cheese she thought would spoil during the week they were gone. Everything went in a bowl with some cooked pasta and I served it up to a group of hungry swimmers invited over for a cookout. I used mini penne for the salad but bowtie, rotini or campanelle pasta would work well too. We had plenty of leftovers and this pasta salad was even more flavorful the next day. What veggies do you like in your pasta salad? 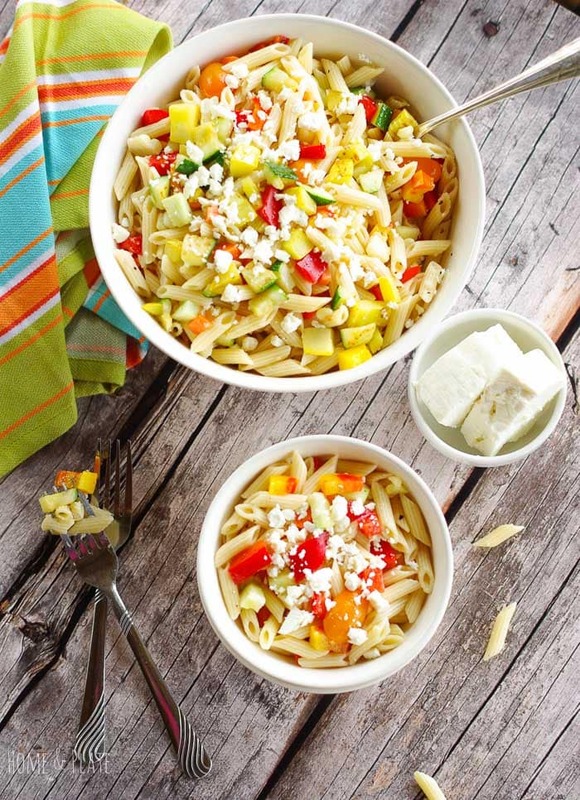 Enjoy a rainbow of vegetables in this easy-to-make summer veggie pasta salad that is tasty and delicious and serves up perfectly at any barbecue. Cook the pasta according to the box directions. Cook until al dente and drain and rinse in cold water and drain again. 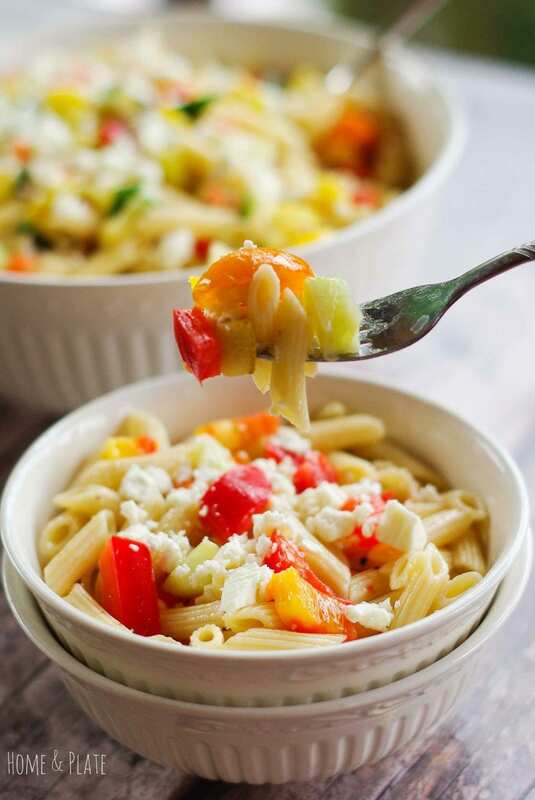 Place the veggies, feta cheese and pasta in a large bowl. In a small bowl, mix together olive oil, balsamic vinegar, oregano, parsley, garlic and salt and pepper to taste. Drizzle enough of the dressing over the pasta salad mixing well. Refrigerate for about an hour before serving. 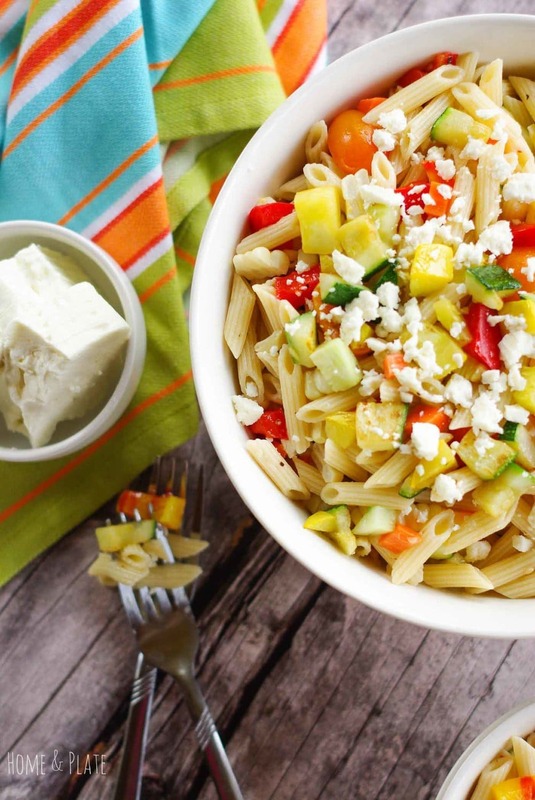 Wonderful looking version of a summer pasta salad! This would be a welcome dish in our home, that is for sure! Looks so refreshing! Great way to get all your veggies for the day. And I can get really excited about anything with Feta. There is something so delish about salty feta especially the fresh stuff in water. I could eat the whole cube. Yum! 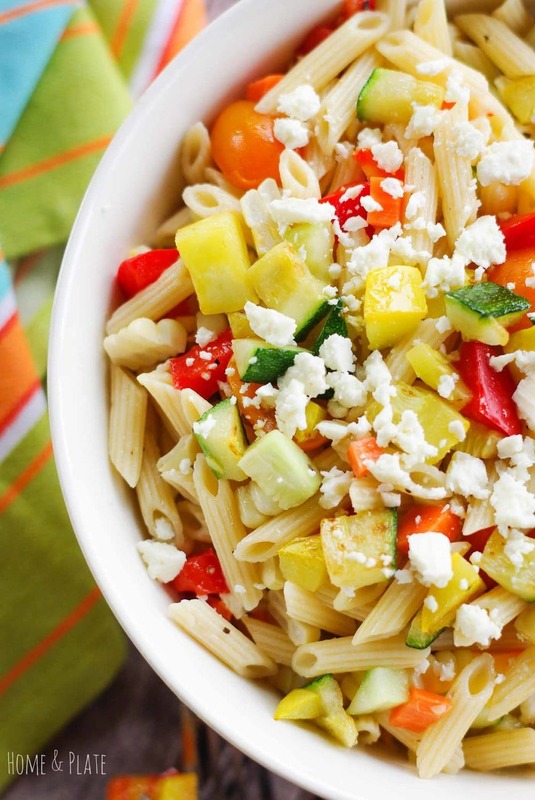 Love the fresh ingredients and beautiful colors in this pasta salad! It is perfect for summer! I am going to the beach for a week. This will be on my list to make for one of my lunches! Me too. Heading oceanside soon:) This is perfect beach food! This might sound a bit snobbish, but I’ve never bought a boxed "pasta salad" — I’ve always made my own, because rehydrated vegetables just don’t appeal and their "flavor packets" are suspect in my view. This is a beautiful pasta salad — with real ingredients! Nothing better! I love recipes like this that can be made with any fresh veggies that you have in the fridge. Having said that, the ones you’ve used like peppers, cucumber and tomatoes are so summery and fresh, I’d have to use those! 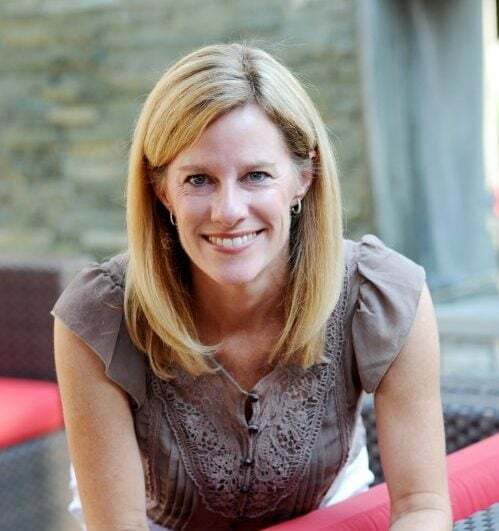 Thanks Natalie…there is nothing like fresh summer veggies to pair with any kind of pasta! What a pretty salad! And way better than any boxed salad mix could ever be!!! !